I love to watch a plant take root and grow to a beautiful tree, the whole process is very fascinating. Ever watch it from the beginning? The whole process of GROWTH. Ever wonder why one seed will grow into a beautiful plant and another will simply die? 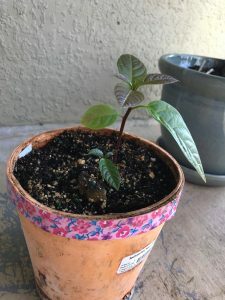 I want to share my most recent experience of an avocado seed. 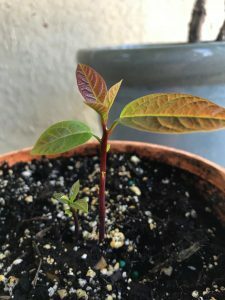 I had this seed that I wanted to grow into a plant, now I have grown these seed to a plant before so I thought this would be easy and the same experience. I took the seed and placed 3 tooth picks in it so that it could rest in a cup of water. This is how I knew to grow the roots. I noticed after a few days the roots began to form, interesting how one seed decides to grow and another simply doesn’t. I have had several recently that simply didn’t root, but this one did. So the roots grew and grew, yet no plant was growing upward, only the roots in the water. I kept watching it and still nothing except roots. I thought perhaps the seed needed help to grow the plant, so I cut the top off the seed. Still after days, no plant. Then I thought, I will cut the seed in half because I could see the roots inside yet the plant was not growing upward. More days went by and still no plant. Finally I decided to plant the half cut seed in soil and give it some water. Several days went by and still no plant. I honestly thought it had died. THEN…I stopped watching it and suddenly I looked over…and there I saw not just ONE but two plants growing! It was such a beautiful site. Now I am watching these two plants growing and it seems they are even growing at a very accelerated rate. It is truly amazing. I think the most interesting thing about all this, is all the energy involved. I believe growth for our own lives can often be mimicked by other growth we can easily observe. For me, my life, this avocado seed is very profound. It signifies the setting in place a strong root structure before the plant would show itself. Now that the “foundation” has taken good root, the growth in the world is obvious and fast! Sometimes it is necessary to build this root structure before we can see the growth. I think the understanding here is to not give up, but also let go of the trying so hard to “make ” it happen, let the roots grow, let go of such intense watching it and keep doing what you know is best. If it is meant to be…you WILL see the growth!